Sobha Indraprastha - Elite homes with royal features! Sobha Developers are coming up with a premium luxurious development in Bangalore named, Sobha Indraprastha that will create a positive impact on masses. The complex is surrounded by open landscaped spaces, lush old trees and keeps you away from the hustle and bustle of the city. The project is still at its completion phase and will be ready for possession by March 2018. Extended over 9.73 acres of land, the development contains high-rise structures in 3B+G+ 37 formats, offering 3 BHK luxurious apartments, duplex and penthouses in different configurations. The apartment size ranges from 1950 sq. ft. to 2370 sq. ft., providing a beautiful space to make you happy and free. The royal architectural gem by Sobha Developers let you enjoy the mesmerizing views of the city’s horizons and amaze you with its intelligent designing. There are 356 units in total, stylized into 2 wings. The super luxurious homes are well-spacious and meticulously planned illustrating style and comfort in every nook and corner. Each apartment is Vaastu-compliant and brings positive energy only. To ensure your privacy, the builder has eliminated the common walls of any type. Each balcony at these homes either faces the skyline or the landscaped gardens to let you enjoy life amidst nature. 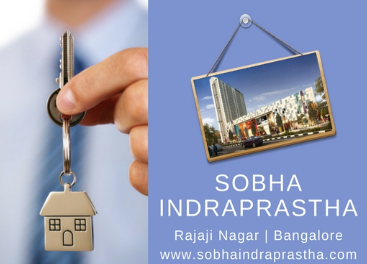 Sobha Indraprastha Rajaji Nagar is well-connected through bus and railways network. The BMTC connects the area to nearby locations. Major roads connecting this locality are 8th Main Road and Mahakavi Kuvempu. Metro Station is just 1 KM from this area. There are several reputed schools in Rajaji Nagar including St. Marks Convent, Gurukripa Education Society, Achala Vidya Mandir High School, St. Anthony’s Convent, National Public School and Kushi Kids. Some of the hospitals and medical centers providing quality healthcare services to the residents are ESI Hospital, Jinka Nursing Home, The Modern Eye Clinic and Government Hospital. Some of the leading banks and shopping malls are also there in this location. Due to this, several top developers have also made their presence in this location. 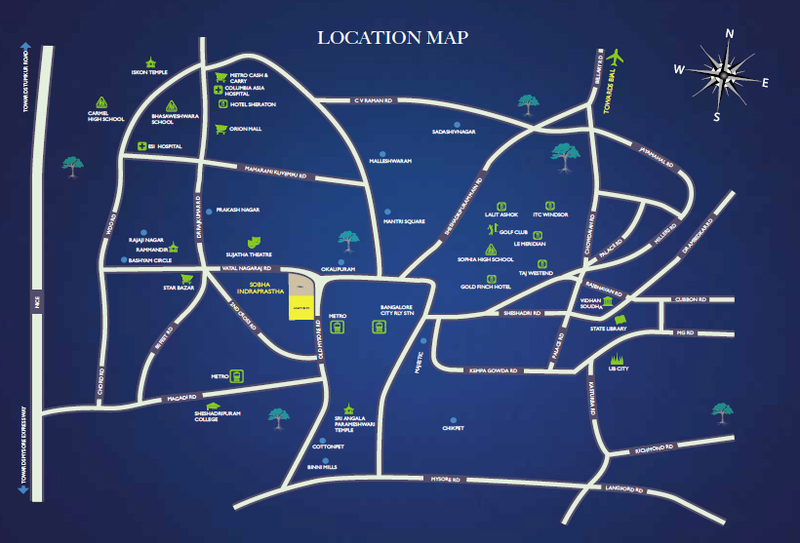 Located at Rajaji Nagar in Bangalore, the residential complex is in close proximity to all the important places. The location of the project is quite charming with its serene and calm surroundings. Banks, schools, shopping malls, and grocery stores are in close vicinity and can be accessed in the shortest amount of time possible. 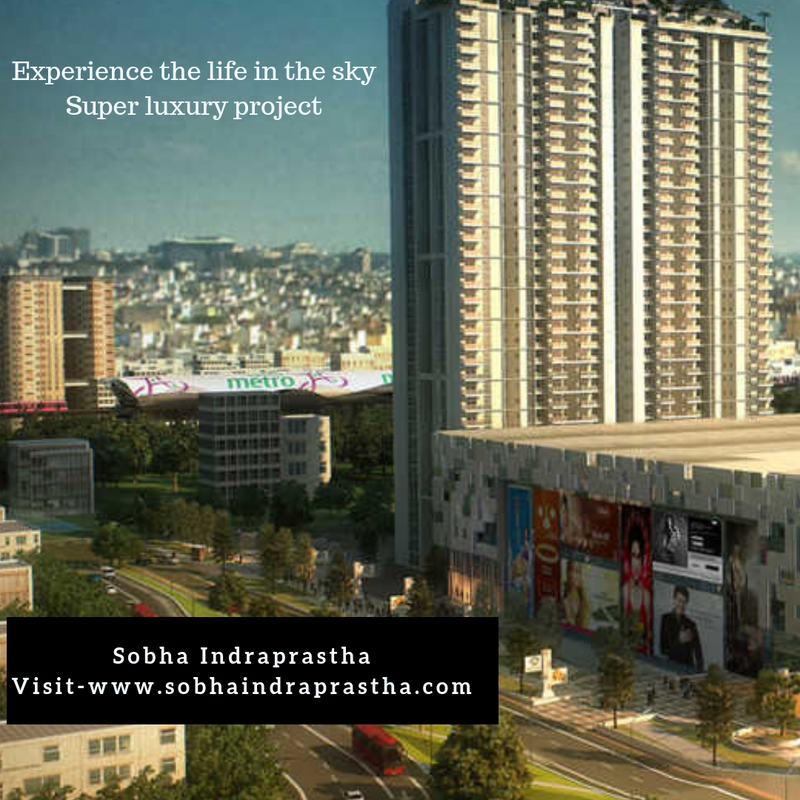 Sobha Indraprastha Price starts at Rs. 2.75 crores that further moves up to Rs. 4.35 crores, depending on the apartment configurations. The exclusive prices are supported by the flexible and possession linked payment plans for the ease of the investors. Along with this, easy home loan facilities are also available for the convenience of buyers at low-interest rates. This is a majestic venture for those with a royal taste and guarantees lifetime happiness. Indraprastha by Sobha Developers is a beautiful presentation in Rajaji Nagar. The company has always strived for benchmark quality, robust engineering, customer-centric approach, and timeless value, transparency in all spheres of business conduct and in-house research, which have contributed in making Sobha Developer a preferred real estate brand in India. With more than three decades of glorious experience, Sobha has become one of the most trusted brands in India. Headquartered in Bangalore, the group is primarily focused on residential and contractual projects. Tagged with supremacy in the luxuries and with several overwhelming responses from the high-end buyers in Bangalore, Sobha Rajvilas is the entrance way of outstanding lifestyle. At this beautiful property, you will get the access to enjoy all those luxury features and specifications which have been dreamt about by each of your family members. Here, 3 BHKs are available for sale which have whopping unit areas. All these homes here are wonderfully designed and superbly executed with world-class interiors and no any element has been missed out here which represents pure luxury. Connected with several major expressways and highways in the city, the location of Sobha Rajvilas Bangalore provides hassle-free commuting to its residents. There are world-class reputed schools, top hospitals, biggest shopping malls around the project. By collecting a wonderful range of lifestyle amenities, some of the major highlights include a grand swimming pool, clubhouse, paved compound, gym, kids’ play areas, party hall, tennis court etc. Located at Minerva Mills Compound, Rajaji Nagar, Bangalore.